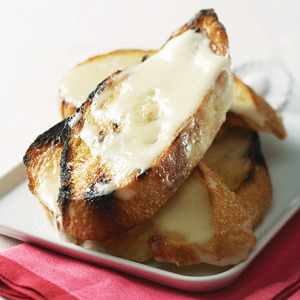 Serve these cheesy grilled toasts as an easy side dish for a pleasing menu. Brush both sides of bread with oil; season with salt. Grill bread, uncovered, over direct heat until toasted on one side, about 2 minutes. Flip bread over. Divide cheese among bread slices. Continue grilling until cheese melts, 3–4 minutes.